Please refer to these links from MEMA’s website for winter storm preparedness information. The DPW phone line will be open for snow removal and plowing requests 24/7 at (781) 268-8000. 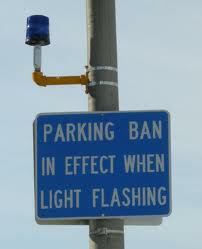 *Please direct storm related concerns to the DPW (781) 477-7099 and Emergencies to 911. Contact the Inspectional Services Department for any Sidewalk snow and icy issues. Click here to contact us or for more information. Review our Snow and Ice Removal Guide here. The Fire Department does their best to locate and remove snow from around fire hydrants. Assistance from residents is greatly appreciated. The City of Lynn is asking residents to keep safety in mind when clearing snow from around their homes. See the next Tab for Winter Safety Tips. The City of Lynn would like to remind homeowners to remove snow from exterior vents connected to heating appliances. Carbon monoxide, a poisonous gas, is known as a silent killer because it is colorless, odorless, and tasteless. Residents are reminded that when clearing snow on their properties they should also check for possible snow build-up around exterior exhaust vents attached to fuel-burning appliances and heating systems such as fireplaces and furnaces. Blockages in these vents can cause carbon monoxide to accumulate inside a home. - Minimize outside activities, particularly the elderly and very young. Also consider your pets. - Dress in several layers of loose-fitting, lightweight clothing, rather than a single layer of heavy clothing. Outer garments should be tightly woven and water repellent. - Wear a hat, mittens (rather than gloves) and sturdy waterproof boots, protecting your extremities. Cover your mouth with a scarf to protect your lungs. - If electricity is lost for an extended period of time, a snowbank in your yard can become a makeshift freezer for food. - Excessive exposure can lead to frostbite, which is damaging to body tissue that is frozen. Frostbite causes a loss of feeling and a pale appearance in extremities, such as fingers, toes, ear lobes or the tip of the nose. If symptoms are detected, seek medical help immediately. - Hypothermia can occur in extreme cases. The warning signs are uncontrollable shivering, memory loss, disorientation, incoherence, slurred speech, drowsiness and apparent exhaustion. If the person’s temperature drops below 95 degrees, seek immediate medical care. - When utilizing alternate heating sources, such as your fireplace, wood stove or space heater, take the necessary safety precautions. Keep a fire extinguisher handy, ensuring everyone knows how to use it properly. Test smoke alarms. - If you lose your heat, seal off unused rooms by stuffing towels in the cracks under the doors. At night, cover windows with extra blankets or sheets. Food provides the body with energy for producing its own heat. - To keep pipes from freezing, wrap them in insulation or layers of newspapers, covering the newspapers with plastic to keep out moisture. Allow a trickle of warm water to run from a faucet that is farthest from your water meter or one that has frozen in the past. This will keep the water moving so that it cannot freeze. Learn how to shut off your water if a pipe bursts. - If pipes freeze, remove insulation, completely open all faucets and pour hot water over the pipes or wrap them with towels soaked in hot water, starting where they are most exposed to the cold. A hand-held hair dryer, used with caution, also works well. - Be a good neighbor. Check with elderly or disabled relatives and neighbors to ensure their safety. Roof Safety Tips | Click here for helpful information to keep your roof and storm drains safe! - Preventing Potential Roof Collapses | With the significant amount of snowfall seen in Lynn, residents and property owners should be mindful of the potential risk of roof collapses. While most commercial and residential roofs are designed to handle loads in excess of what currently exists on rooftops, the current snow pack and potential for additional precipitation does increase the risk of collapses or other structural damage to properties. While there have been few issues reported in Boston, there have been several reports of roof collapses across the Commonwealth. Homeowners and building owners who have concerns about excessive loads and/or the structural integrity of a property, should contact a professional/licensed contractor for assistance. Removing snow from a rooftop can be extremely dangerous, so it is best to rely on professionals. New Ocean Street at Eastern Ave. Spruce Street at Oak St.
Revere Avenue at Walnut St.
Front Ent. and Bike Rm. 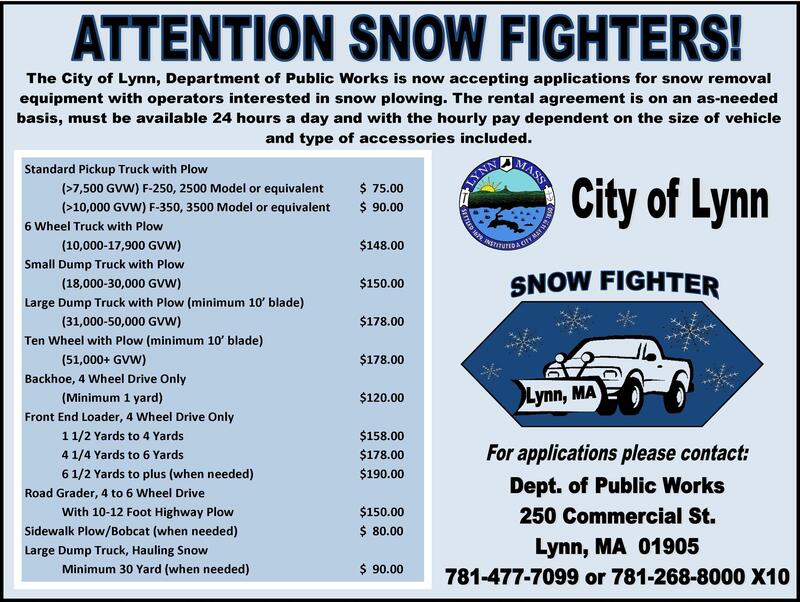 Lynn DPW is now taking applications for snow removal equipment with operators interested in snow plowing. The rental agreement is on an as-needed basis with the hourly pay dependent on size of vehicle and type of accessories included. Pay rates range from $75 to $190 per hour for equipment with operator. 4 Wheel Drive is required for vehicles up to 18,000 LBS. Please note, a copy of your drivers license and a current W-4 form are also required with your application. Please download the appropriate forms below. Grid as to your outage. If multiple residents in your area call it will immediately alert National Grid to a more widespread outage. It is very important that ALL residents experiencing an outage call National Grid immediately when an outage occurs so that prompt repair of the problem can begin. Please do not call the Lynn Police or Fire Departments to report an outage unless you have an emergency. Dial 911 in case of emergency. Please visit the National Grid website for helpful information on preparing for power outages and storm situations.